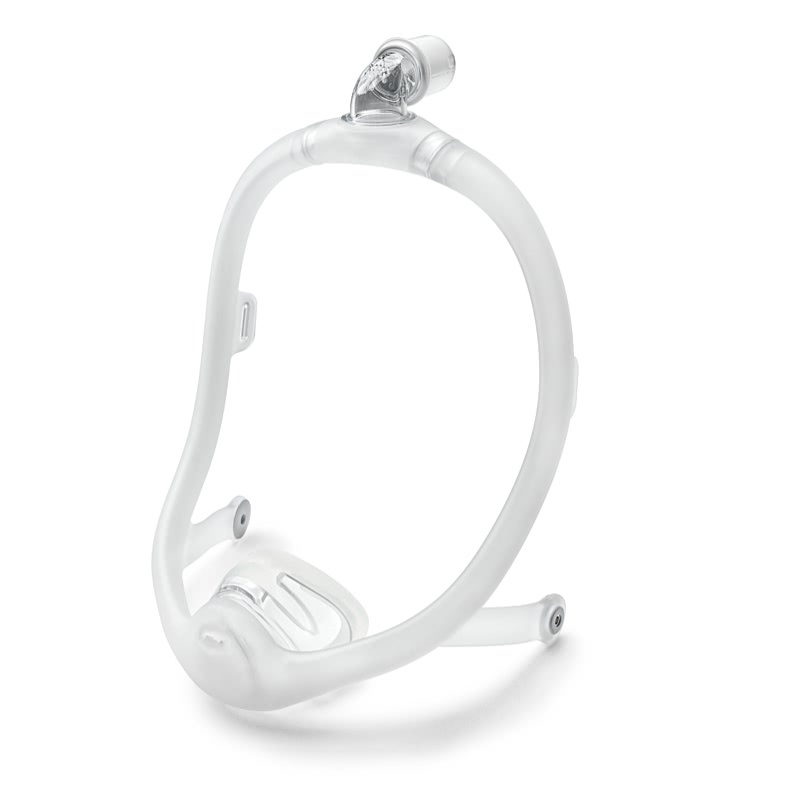 The Philips Respironics DreamWisp CPAP Mask - Fit Pack takes comfort to a new level. It comes with a medium frame connector and cushions in three sizes: small, medium and large; easily adapting to almost any face. 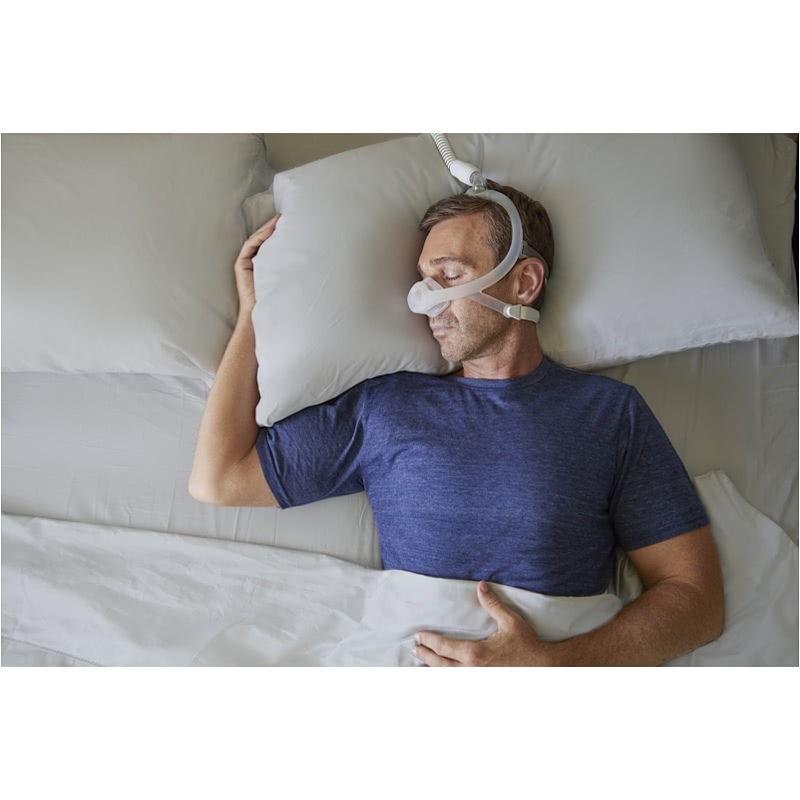 The DreamWisp takes your personal comfort seriously, creating a mask allowing for almost any sleeping position— even side and stomach sleeping. The top-of-head hose connection is also on a 360-degree swivel, providing greater flexibility for active sleepers without breaking the seal. It also eliminates most of the bulk from the front of the face, providing a wide open field of vision. You can comfortably engage in most of your favorite bedtime activities, like reading, watching TV, or using electronics. 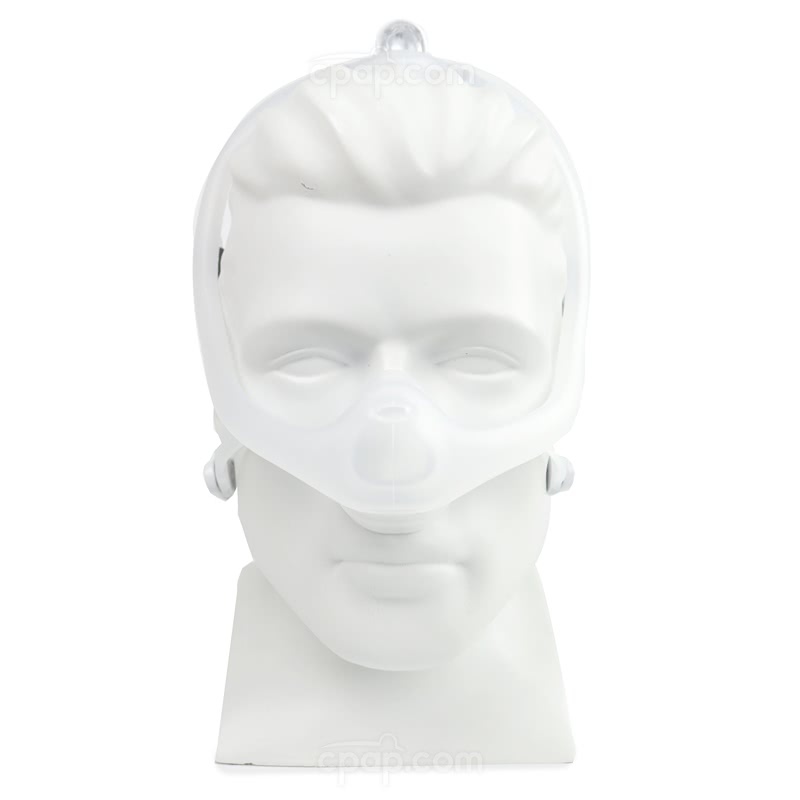 11% of Nasal Mask product buyers choose this product. 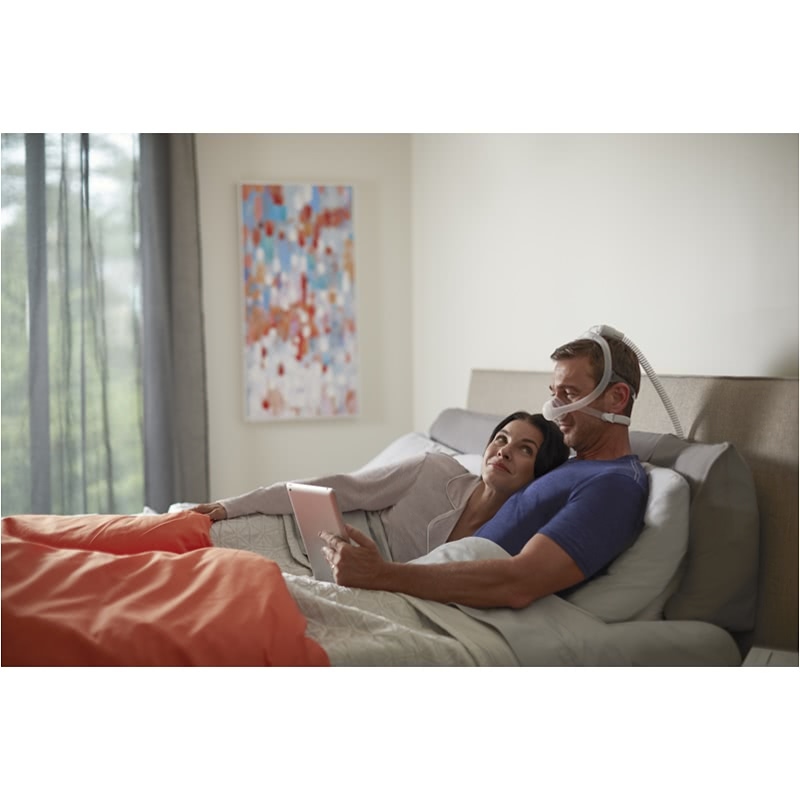 The Philips Respironics DreamWisp Nasal CPAP Mask - Fit Pack makes it easy to get the right fit by providing three main popular cushion sizes, so you won't have to measure or guess the best size for your face. This way, you can easily experiment until you get the right fit. A medium connector is included, however small or large connectors are available separately for purchase if needed. Overall, the DreamWisp combines the most popular design elements from the DreamWear and Wisp masks and blending them into one solution created with your comfort in mind. Are you a side sleeper or a stomach sleeper? Have you had to give up your favorite sleeping position to accommodate your mask? 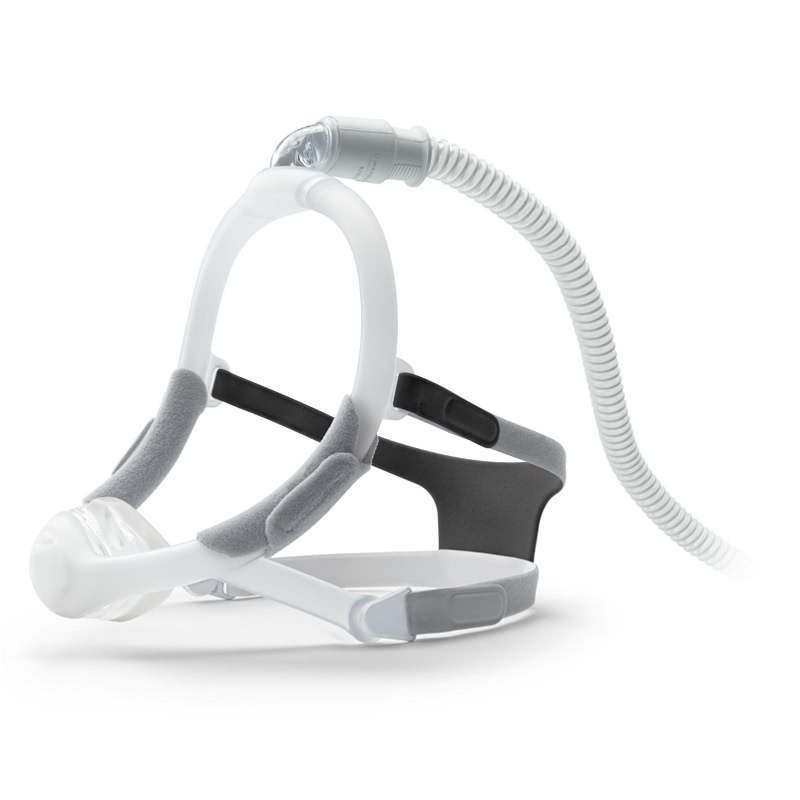 With the DreamWisp Nasal Mask, you can sleep in the most natural way and not have to compromise. The DreamWisp is lightweight and very flexible. Are you a small, medium, or large? By ordering this Fit Pack, you'll get cushions in all three sizes so you won't have to guess. You can try each one, or experiment with a few sizes until you find the perfect fit. There are also petite and extra large cushions available separately if needed. If you usually wake up in the morning tangled with your hose, you'll appreciate the 360-degree swivel from the hose connection. It's just as active as you are, and it will help keep you from getting caught up in your hose. By positioning the hose connection at the top of the head, it also removes a lot of the bulk from the front to the face. 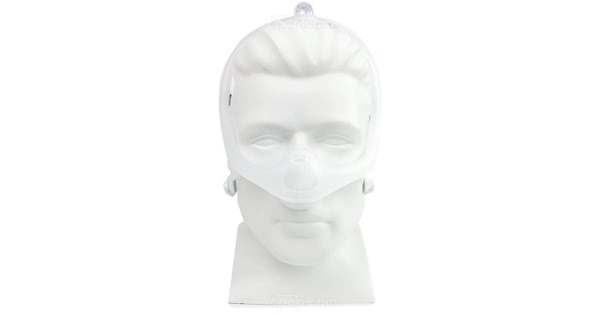 For those who enjoy washing their dishwasher-safe CPAP items in a dishwasher, the frame and cushion of this mask can be washed in the dishwasher once per week. Do not wash the headgear in this manner, as it could cause damage or loss to the headgear. Cleaning in the dishwasher will help sanitize hard to reach places, such as the inside of the frame. With the DreamWisp, air travels from the elbow through the frame and then entering the cushion. This helps minimize drawbacks and reduces the number of parts and touchpoints on the face. This can mean fewer red marks and less irritation. 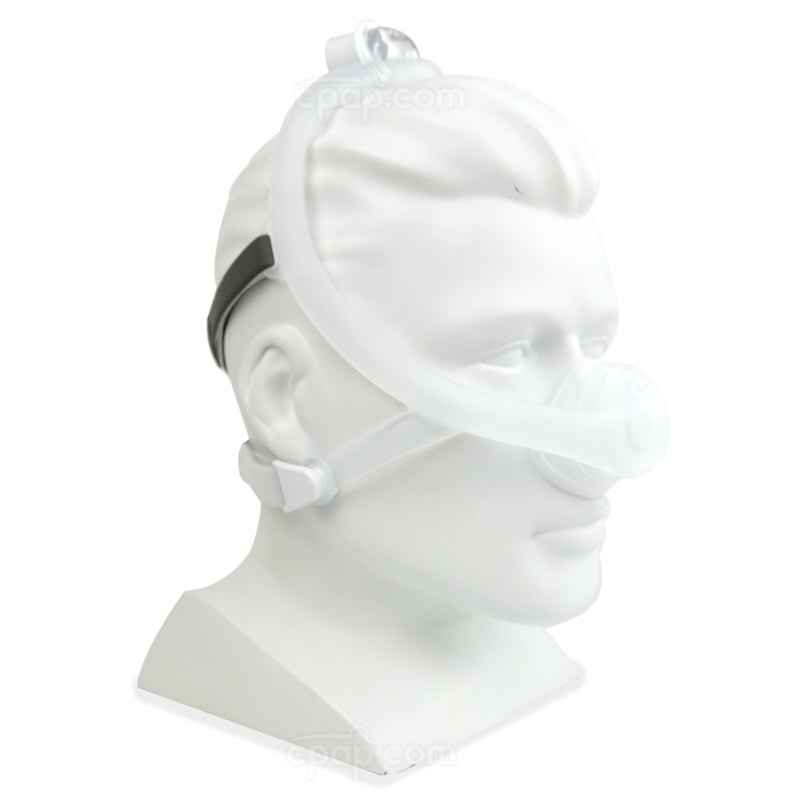 If your current nasal mask is designed to provide therapy air to the base of the nostrils, in some cases, you may find it more difficult to get a good seal. The DreamWisp solves this problem by providing a cushion sealing around the base of the nose, helping create a more reliable fit. The cushion is also designed to minimize the bulk usually associated with over-the-nose cushions, making it possible to engage in favorite activities before bed. 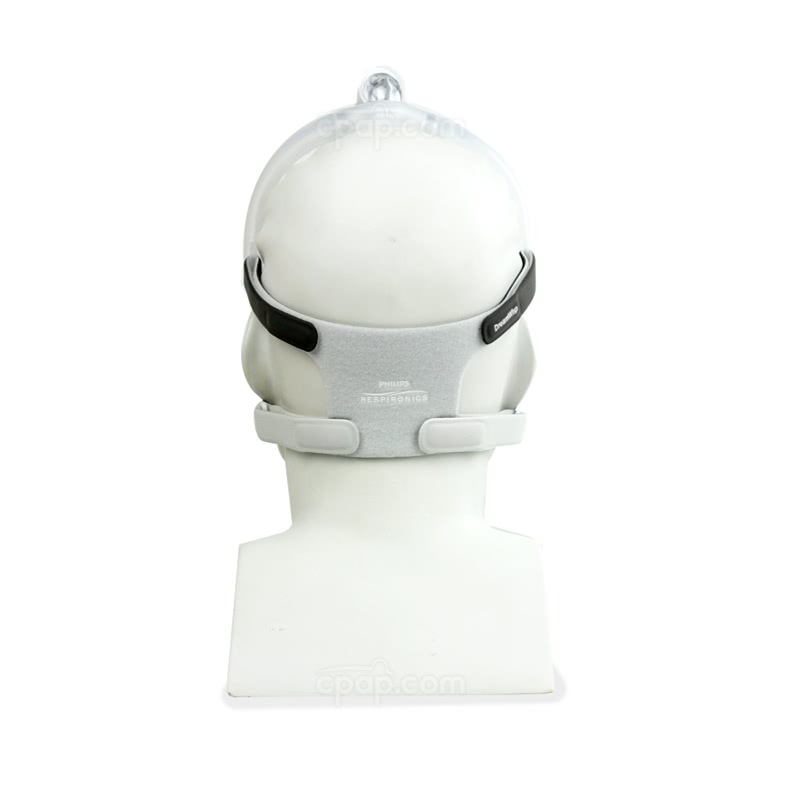 Magnetic headgear clips make it easy to put on and take off, and they also do a good job of anchoring the headgear to the mask frame. They support a minimalist design that has fewer touchpoints on the face, helping create fewer marks and fewer impressions in the skin. By having more than one place to vent exhaled air, the resulting mask noise level is reduced. This can make it easier to fall asleep and stay asleep and can help make it more enjoyable for bed partners. 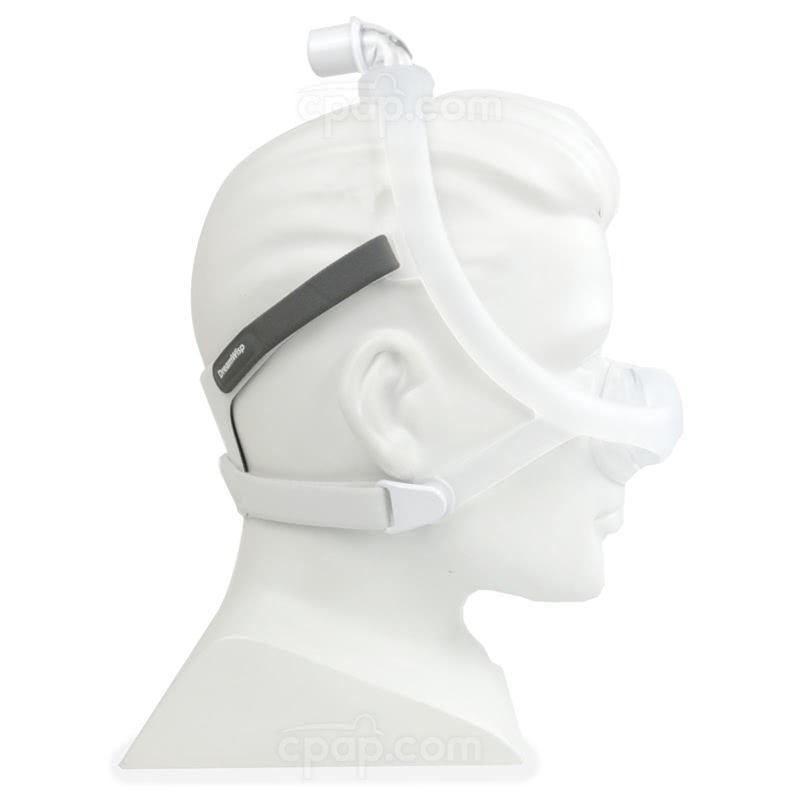 All masks sold by CPAP.com come with a 30-day money back guarantee we call "Free Return Insurance". Try it out for up to 30 days, and if you're not satisfied you can return it for any reason. Disposal: Dispose mask and headgear annually in accordance with local regulations. It can be easy to put on the DreamWisp, and once you've done it a few times, you'll learn the routine and it may become easier. 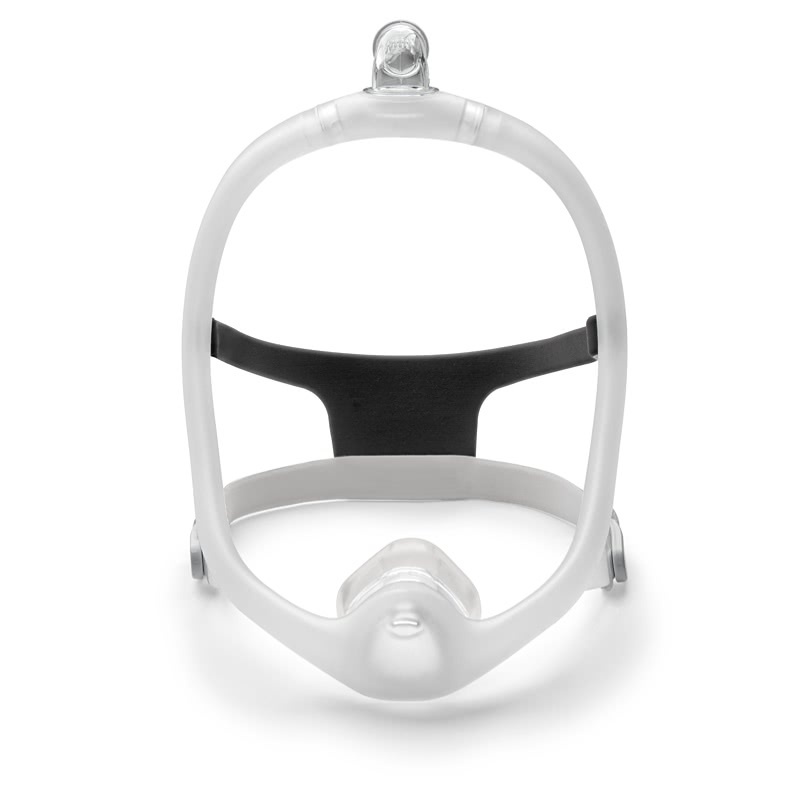 Make sure to unclasp the headgear from the mask frame itself using the magnetic clips, and connect your tubing to the elbow. Slide the headgear over the back of the head. Position the cushion over the nose, reconnect the magnetic clips, and adjust the straps until it becomes more comfortable. Fit should be firm, but not uncomfortably tight. It's normal for air to escape from the DreamWisp, especially near the exhalation ports of the mask. You'll notice two: one near the cushion and one on top of the mask near the elbow. If the blowing air is uncomfortable or gets blown into the face or eyes, this is a sign of a leak. Most leaks can be corrected by repositioning the cushion and tightening the straps. If the straps pinch or feel too tight, it may be time to choose a larger or smaller sized cushion. The frame and cushion can be cleaned by hand or in the dishwasher. Cleanings in the dishwasher should not be more frequent than once a week, as this can reduce the lifespan of the mask. Avoid washing the headgear or soft wraps in this manner, as the heat of the dishwasher can damage these items. Disassemble the mask, removing the headgear, cushion, frame connector, and elbow. Wash the mask components with water and a mild soap, rinsing thoroughly when completed. The cushion should be cleaned with Mask Wipes, or mild soap and water. Make sure to clean the mask thoroughly, removing any deposits left behind. Allow all parts to air dry. The DreamWisp headgear clips contain magnets. Keep at least 2 inches away from implanted medical devices such as pacemakers, defibrillators, and any device sensitive to magnets. Do not use during a procedure using magnetic resonance technology, such as an MRI or CT scan. Discontinue use and contact your doctor if any of the following occur: chest discomfort, shortness of breath, severe headache, eye pain or eye infections. Also contact your doctor if you experience skin redness, irritation, discomfort, blurred vision, or drying of the eyes. Do not overtighten headgear straps. Doing so can increase the occurrence of red marks and impressions on the skin. Loosening the straps will alleviate these symptoms.